Lips and eyes are considered the face and personality introductory. 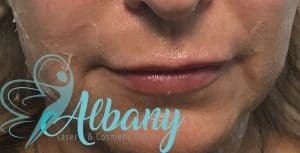 Therefore, before starting lip filler it is essential to help the client to choose the lip style that fit her style. While eye style can be adjusted using makeup, the lips style is a combination of fillers and lipstick. Not all faces will tolerate bright red lipstick, nor full lips. lip fillers and injection location have to be chosen carefully to help the client project the first impression when meeting people. Some clients need to keep an innocent face and small facial feature, others would like to have large prominent lips. Even the defining some lip anatomy might give a different style using the same amount of fillers. Having a defined cupid bow is associated with stronger sexual desire. One more example is having equal upper and lower lips which are frequent with African American require the client to have strong facial feature. The golden lip ratio of 1:1.6 can be crossed if the client understands the results. Lip fillers injection is an art that cannot be tough and need to be acquired over time. 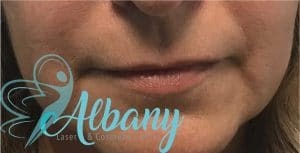 This lovely client has full lower lips but thin upper lips. Logically, we need to focus on lip injection in the upper lips. She made it clear to us that she does not people to notice a huge difference is her facial feature, therefore we decided to keep the same proportion between the upper and lower lips. We focused on defining the vermilion boarded and the pillow of the lower lip. therefore, having a conversation with the client and understanding the expected end results is important in lip fillers.